The front porch was described as a “transitional space between the private world of the family and the public realm of the street,” by Andrew Jackson Downing, a well known 19th century landscaper. While the purpose of a porch may have evolved from a place to drink sweet tea and gossip to a place where families sit to enjoy a meal or the sunset together, the fact still remains that a porch is an essential and desired feature for many home owners. Here are some things to think about when planning the construction of your new porch. The porch is an accessory, so it shouldn’t overwhelm the main structure of the house. It should, however, be large enough to look like part of your home instead of an afterthought. Think about what you want to use your porch for. If you envision dining al fresco with your family during warm-weather months, you will want a porch that is at least 8-10 feet deep to accommodate a good-sized table and chairs. However, if you just want to place a loveseat or a couple of chairs on your porch, somewhere around 6 feet deep should be sufficient. 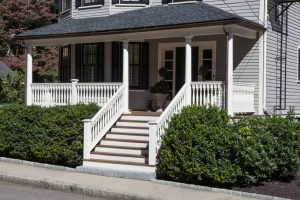 If your home has the flexibility, the side of your home your porch is on is important. A south-facing porch will take advantage of the sun’s heat, but could also get uncomfortable during the summer. If the idea of cocktails at sunset is appealing, place your porch facing west. Early risers may want maximum light to read the paper and sip coffee with an porch facing east. Don’t forget about accessing the porch from the home, and what design impact that may have on the interior rooms. For example, you may want to install French or sliding glass doors from the living room or kitchen to create an entrance to the porch. To ensure aesthetic continuity, try to use the same materials to build your porch as are used in the home, especially the exterior surfaces. This includes coordinating millwork and other design motifs so that your new porch looks like a continuation of the rest of your home. You should also take into account any other factors that could affect the enjoyment of your new porch. Consider installing screens if you live where there are lots of flying insects, or glass windows so you can extend the use of your porch into cooler months. If you plan to use the porch during the night hours, make sure you install either sufficient lighting or outlets for lamps. A ceiling fan is a good idea to make the space more comfortable in warm temperatures. Use social media for some inspiration. Pinterest will have some great ideas of ways you can decorate your porch, and of how to make it look more inviting. If you aren’t ready to decorate your porch right away, pin the pictures to your board and come back to them later. Instagram is also another resource you can use to get ideas of how to stylize your new porch. Before you know it, you and your family can begin to relax and enjoy the summer season from the comfort of your new porch—or have an attractive feature to offer to buyers.